Paul Gorbold, left, is chased by Tim Mt. 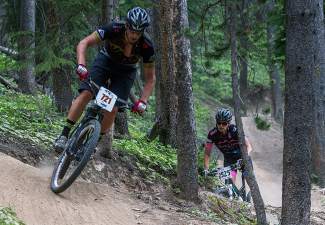 Pleasant, right, while descending the Radio Flyer portion of the Vail Grind mountain bike race in 2014. The popular Radio Flyer trail will be extended by about a mile this summer as part of a package of improvements to the resort's trail system being undertaken by Momentum Trail Concepts. EAGLE COUNTY — The last of the remaining trails affected by seasonal closures in the White River National Forest opened Friday with the 10-mile Two Elk Trail from Vail Pass to Minturn. Deputy District Ranger Aaron Mayville confirmed Friday that all trails within the White River National Forest in Eagle County are now open for summer. The seasonal closure of Two Elk — a Colorado Department of Parks and Wildlife stipulation intended to promote elk calving — extends to all of Vail Mountain’s Back Bowls. Vail Mountain opted to open the Grand Traverse trail on Friday. Grand Traverse is a 4.9-mile singletrack trail that takes mountain bikers around through Sun Up and Sun Down Bowls before terminating at Patrol Headquarters atop Chair 4. It connects to the Mid-Vail Escape trail, winding through the Mid-Vail area. The Mid-Vail Escape trail is not yet open. Hiking trails yet to open on Vail Mountain include the popular Kinnikinick and Sunlight trails in the Chair 4 area out of Mid-Vail. Rust says those trails are expected to open soon, and construction on a new hiking trail in the Mid-Vail area, Ophir Loop, will begin in the coming weeks. On the hiking end, Vail Mountain this week also unveiled their new learn through play hiking experience on the Fireweed and Eagle’s Loop trails atop the Eagle Bahn Gondola, as part of the resort’s Epic Discovery platform. The trails contain 10 story stakes — interpretive stories about the native animals, plants, trees and the environment — and 10 animal ability exhibits where guests can learn about the skills possessed by local animals. The Eagle’s Loop trail also contains five viewing tubes which show guests points of interest through photos, interpretive stories and fun facts. Vail Mountain Chief Operating Officer Chris Jarnot said those involved in developing the interpretive elements of the trails learned a few things about their surroundings during the process. While the Ophir Loop is the only new trail to see construction on Vail Mountain this summer, connectivity will be increased to the Mane Lane trail and the popular Radio Flyer mountain biking trail will be extended by about a mile. Vail Mountain has enlisted in the help of Momentum Trail Concepts, who has built trails in Avon and Eagle recently, for much of their trail work this summer. Rust said when Momentum finishes extending Radio Flyer, Vail Mountain will ask the company to do more maintenance and sustainability work on other trails in the network. “This is a partnership that I look forward to perpetuating into the future, for sure,” Rust said. Weather conditions — such as rain — will prompt Vail to not allow bike hauls in an effort to preserve the trails. For information on bike hauls, trails and closures, check with the ticket office at the base of the lift or call 970-754-8245.